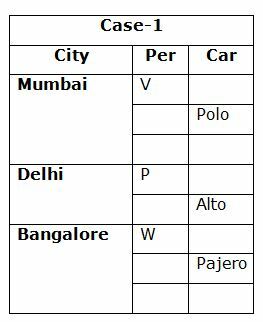 Eight persons P, Q, R, S, T, U, V and W are belongs to three different cities Mumbai, Delhi and Bangalore in such a way that not less than two and not more than three persons belongs to the same city. 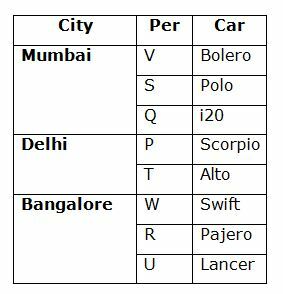 They are having eight different cars namely Alto, Bolero, i20, Lancer, Polo, Scorpio, Pajero and Swift but not necessary in the same order. Q belongs to the same city as the one who has Bolero. Only P and the one who has Alto lives in the same city but not in Mumbai. 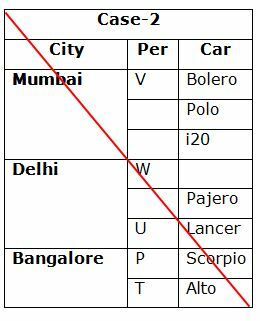 U does not live in the same city as Q. V lives in the same city as the one who has Polo but does not live in Bangalore or Delhi. The one who has Pajero lives in the same city as W, who does not live with V. P does not have Pajero. U has Lancer but does not live with the one who has Polo. The one who has i20 lives with the one who has Bolero. V does not has i20. T belongs to the same city as the one who has Scorpio but not with U. The one who has Swift does not belongs to Delhi. S neither has Pajero nor has i20. 1. 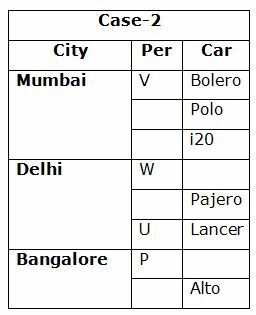 W has which of the following cars? Only P and the one who has Alto lives in the same city but not in Mumbai. The one who has Pajero lives in the same city as W, who does not live with V. P does not have Pajero. U has Lancer but does not live with the one who has Polo. The one who has i20 lives with the one who has Bolero. V does not has i20. T belongs to the same city as the one who has Scorpio but not with U. The one who has Swift does not belongs to Delhi. Q belongs to the same city as the one who has Bolero. U does not live in the same city as Q. S neither has Pajero nor has i20. 2. 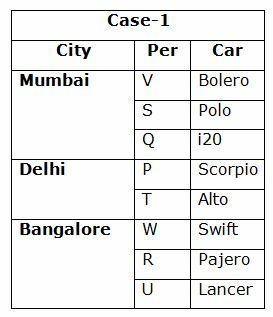 T belongs to which of the following cities? 4. 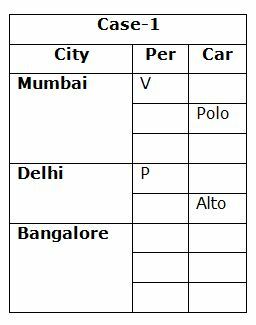 Which of the following pairs belongs to Mumbai? 5. Who among the following has Alto? Direction (6-8):Read the following information carefully and answer the questions given below. Eight persons A, B, C, D, E, F, G, H are in different heights. A is taller than only two persons. F is taller than A, but not taller than D. There are four members between H and G, and both are not tallest or shortest among the group. B is tallest among all the persons. Only two persons between B and E. G is shorter than E.
6. Who among the following persons was second tallest? 7. How many persons are between D and G? 8. If A is 164 cm and D is 171 cm, then what will be the possible height of F? Direction (9-10):Study the following information carefully and answer the questions given below. Five persons B, M, Q, L and T are arranged according to their weight. B is heavier than only one person. Two persons are lighter than Q. T is heavier than L but lighter than M.
9. Which of the following person is the heaviest? 10. How many persons are lighter than T? 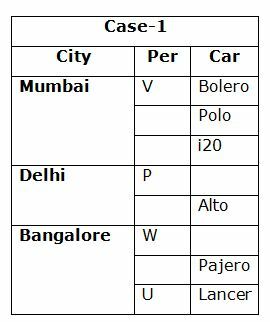 1) W has which of the following cars? 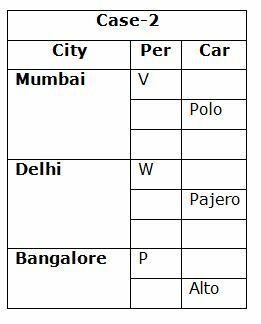 2) T belongs to which of the following cities? 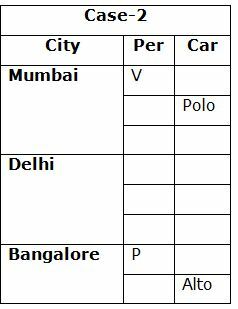 4) Which of the following pairs belongs to Mumbai? 5) Who among the following has Alto? 6) Who among the following persons was second tallest? 7) How many persons are between D and G? 8) If A is 164 cm and D is 171 cm, then what will be the possible height of F? Direction (9-10):Study the following information carefully and answer the questions given below. Five persons B, M, Q, L and T are arranged according to their weight. B is heavier than only one person. Two persons are lighter than Q. T is heavier than L but lighter than M.
9) Which of the following person is the heaviest? 10) How many persons are lighter than T?